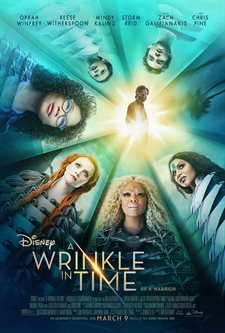 Download A Wrinkle in Time in Digital HD from the iTunes store. A Wrinkle in Time images are © Walt Disney Pictures. All Rights Reserved. In 1962, American Writer Madeleine L'Engle published the novel, A Wrinkle in Time. While it won critical acclaim, it was controversial in that it was a Science Fiction novel with a young, female protagonist. In 2003, Disney adapted the story for a television movie and this month they once again have re-envisioned it as a feature film. They bring Meg, Charlies Wallace, Calvin and the three Mrs. - Which, Whatsit and Who – to life while exposing audiences to the adventures of these young adults. With beautiful visuals, this film hopes to draw audiences in and open them to the idea of what could be possible while offering the usual moral fare we have come to expect from a Disney film. Meg (Storm Reid; 12 Years a Slave) is a preteen girl struggling with all the same insecurities that most middle school kids face. Her difference is that her father disappeared four years ago without a trace and she has since withdrawn into herself because of it. She also helps take care of her younger brother Charles Wallace (Deric McCabe) who is apparently brilliant but a little different. When he answers the door to what amounts to a very strange woman named Mrs. Whatsit (Reese Witherspoon; Walk the Line), things suddenly seem to spiral out of control. Mrs. Whatsit, along with Mrs. Which (Oprah Winfrey; The Color Purple) and Mrs. Who (Mindy Kaling; The Office), inform Meg, Charles Harris and Meg's friend Calvin (Levi Miller) that the tesseract, a phenomenon explained as folding space and time in order to travel through dimensions, really does exist and that Meg and Charles Wallace's father (Chris Pine; Star Trek) is trapped in one of the dimensions. The three children then follow the Mrs. Through "the wrinkle" in order to find and save Mr. Murry. There they find "all the evil in the Universe", called simply "it" which is taking over. In order to save her father and her brother, Meg must confront all her faults and learn to accept them. The best part of this film is the cast. Winfrey, Witherspoon, and Kaling are enjoyable in their respective roles with Kaling being cute as she speaks mostly in quotes and Witherspoon being quirky and funny. Winfrey is well cast as the elder stateswoman of the trio, imparting knowledge to everyone around. Reid, Miller, and McCabe are excellent and show talent well beyond their tender ages. McCabe especially manages to steal every scene he is in. Pine fares better here than in some of his other films displaying a range of emotions we don't usually see from him. The visuals are also excellent throughout the movie. The colors are magnificent and the costumes are especially well done. The other dimensions offer a variety of backgrounds with great attention to detail. The soundtrack is full without being overpowering and the movie offers a certain appeal for those to whom it was intended - preteens with vivid imaginations. Unfortunately, that is where my praise ends. The movie, overall, is boring and at times cringe-worthy. It also reminded me of The Never Ending Story in some regards; only the latter did it much better. When Mrs. Whatsit transforms into a giant leafy creature that flies, I was reminded of the luck dragon and when the kids come face to face with the evil in the universe -"it"- I was reminded of the nothing that is taking over the realms of the second film. Wrinkle also throws in the moral lessons from the very beginning from which the viewer cannot escape. Seeing it all from the viewpoint of a twelve-year-old, I guess it is somewhat appealing but for older audiences, it just doesn't work which is a shame because it had so much potential. let’s see how Disney does with this classic sci-fi novel! Loved this book as a kid. Can not wait!